The IDE has three sections this bit, the information pane, the editor and the terminal. The IDE is capable of programming ByPic devices and also sending and receiving information from the wifi to serial convertor or any other device that has an ESP8266 programmed with ByPic firmware (free see). The firmware should be up to date. This is the communication to and from the connected device. Any text entered will be sent to the connected device when the enter key is pressed, response form the device will be shown in the same window. The web socket is a browser alternative to a direct TCP connection and is the most direct form of connection to a device, very similar to connecting the device via a COM serial port except that it uses wifi. The GET HTTP type creates a connection each time something is sent, there is more details of how this works in the get document. 1) Short GPOI0 to ground for more than 6 seconds, this can be a jumper or button on some devices. Then use the ESP built in browser to set the IP and wifi code. The flag will be set by default. 2) Use the UART end of the device to set the sysflag: sysflag=16. This can only be achieved if the UART end is available. 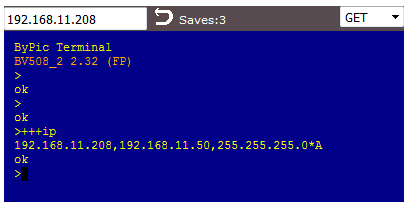 3) Use telnet or BVSerial to connect to the wifi and then set the flag from there. BVSerial uses pure TCP sockets and so does not need any browser information. Here the ip address of the wifi is shown with the +++ip command. Doing this from web sockets would be ineffective. ByPic devices: |A will use the ByPic loading protocol to get the program over to the device. Before sending it will clear out the devices RAM, if // #include "filename" is encountered it will save that file to flash, if // #add "" is encountered it will send that file to RAM, this will also apply to nested files within those files. When |S is used the RAM is not cleared first. Other devices and GET: Will simply send the raw text.